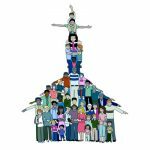 Webster’s Dictionary states that the Greek word doma (house) must be added to kuriokos in order to make the English word “church” what it has come to mean today – “the Lord’s house,” that is, an edifice consecrated for public worship, an idea that is totally foreign to the New Testament. The original Greek word ekklesia had nothing to do with this modern concept of “church.” Rather it meant “separation from others” (2 Cor 6:17; John 17:14-17 etc). Credit: Dr. Stanley Morris, Chairman, Translation Committee, p. lxxvi, Intro. to International English Bible, © 2014.